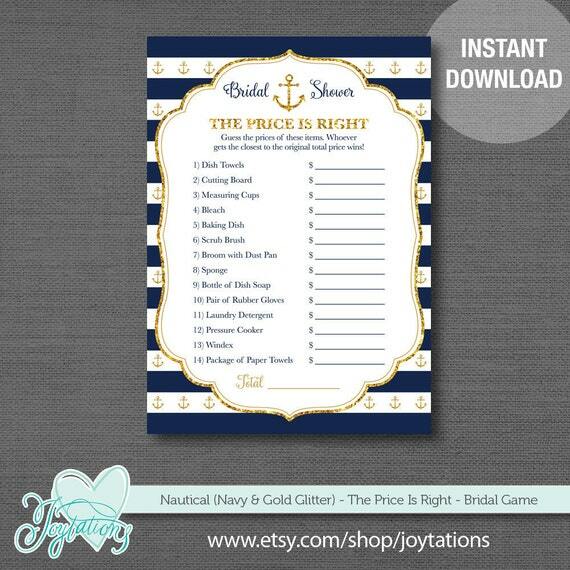 You'll receive high resolution print ready PDF digital files of the "Nautical 2N (Navy and Gold Glitter) - The Price Is Right" bridal shower game within a few minutes after purchasing. These are digital files for you to print at home or at a local print shop. Physical item(s) will NOT be shipped to you. This is NOT an editable template. Since this is an instant download, customization is NOT included in pricing but is available for a small additional fee. Please see link below for details on customizing. This game measures 5"x7" (inches). Instant download files are automatically sent to the email address that you have on file with Etsy within a few minutes after purchasing. Also after purchase, you will be taken to a page on Etsy where you can download the digital files that you purchased. If for some reason you don’t get to download your files right after you purchase, you can always get to your purchased files by going to the “Purchases and Reviews” section under your account in ETSY. Just click on the download button beside the order and you’ll be able to save the files to your computer and then print. Please make sure you download your files and save them to a desktop or laptop computer. If you're uploading your files to a printing company's website so they can print for you, ONLY upload the files after you saved them to your computer. Joytations' digital files will ONLY work in Adobe Acrobat Reader, they will not work with Microsoft Word, Photoshop or any other program. Joytations does not offer returns, exchanges or cancellations.